PostgreSQL – Page 2 – Java, SQL and jOOQ. I stumbled upon an interesting question on Stack Overflow recently. A user wanted to query a table for a given predicate. If that predicate returns no rows, they wanted to run another query using a different predicate. Preferably in a single query. The common table expression (WITH clause) wraps the first query that we want to execute no matter what. We then select from the first query, and use UNION ALL to combine the result with the result of the second query, which we’re executing only if the first query didn’t yield any results (through NOT EXISTS). We’re hoping here that the database will be smart enough to run the existence check on a pre-calculated set from the first subquery, in order to be able to avoid running the second subquery. Let’s see, which database actually does this. 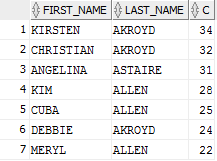 So, indeed, the database seems to be smart enough to avoid the second query, because the first one does yield 9 rows. What about the inverse case? In the above benchmark, we’ve measured how much time it takes when the first query succeeds (and the second query should be avoided). What about the inverse case, where the first query doesn’t match any rows and we have to run another query? A slight overhead in the single query case. But what’s this? We didn’t even have an index on the LENGTH column. Let’s add one! While the estimates are off just as in PostgreSQL (an error that can propagate, see conclusion), the actual rows for the second subquery is zero, and the second subquery is run zero times (“Starts”), because we don’t have to really access it at all. Excellent. Exactly what we expected! This time, the combined query is a bit faster! Remember to benchmark the right data set. We only have 600 films in this table. What would happen with 60 million films? Note, you can trust me that adding an index doesn’t change much in this case. We’ve seen that we can easily solve the original problem with SQL only: Select some data from a table using predicate A, and if we don’t find any data for predicate A, then try finding data using predicate B from the same table. Oracle and PostgreSQL can both optimise away the unnecessary query 2 by inserting a “probe” in their execution plans that knows whether the query 2 needs to be executed or not. In Oracle, we’ve even seen a situation where the combined query outperforms two individual queries. SQL Server 2014 surprisingly does not have such an optimisation. While the performance impact was negligible in all benchmarks (even in SQL Server), we should be careful with these kinds of queries and not entirely rely on the optimiser to “get it right”. In all three databases, the cardinality estimates were off. We’re working with small data sets, but if data sets grow larger, and queries like the above are embedded in more complex queries, then the wrong cardinality estimates can easily produce wrong execution plans (e.g. favouring hash join over nested loop joins because of a high number of estimated rows). An example of this was given in a previous blog post. Nevertheless, we can get quite far with SQL, without resorting to procedural client languages and if I had conducted my benchmark with a JDBC client instead of procedural blocks directly inside of the database, perhaps the single query would have outperformed the double query case – at least in those cases where query 1 yielded no rows and query 2 had to be executed from a remote client. Probably in Oracle. Ultimately, I can only repeat myself. Measure! Measure! Measure! There’s no point in guessing. Truth can only be found by measuring actual executions. The above query will return a number > 0 if we any Wahlberg played in a film, or 0 if not. Notice that we don’t care how many films all the Wahlbergs played in, yet we ask the database to calculate the precise number. 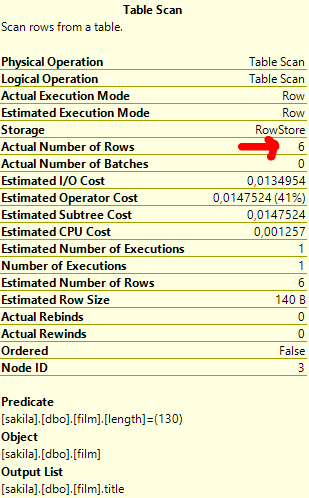 As you can see from the above execution plans, the cost in Oracle is slightly better (going from 3 to 2) when using EXISTS than when using COUNT(*), because of a much better cardinality estimate in the middle of the execution plan. In other words, Oracle “knows” that we’re looking for only one record and as soon as that record has been found, we can stop looking. In PostgreSQL, things are more drastic (going from 123 to 3.4). The EXISTS version has an associated cost that is almost 30x lower than the version that uses COUNT(*) for the same result. Yes. I’m taking bets. Many many code bases out there get this wrong all the time. Checking for sizes to be zero is just too convenient. Not only in SQL, but also in Java. Consider this. Which one is better? But what if your collection is a lazy loaded Hibernate collection? Not all collections cache this size value, and even if they do, they may still produce overhead in the source system in order to calculate the exact size. In fact, they might even run a completely unnecessary query fetching all the child entities from the database just to check for existence. OK, costs. But what does it mean? Let’s benchmark these two statements in Oracle and PostgreSQL. (not actual times, because thank you Oracle legal for prohibiting all sorts of stuff). But you can check out the Sakila database yourself and run the above benchmark on your machine. A whopping factor 40x in terms of wallclock time gain! That’s something! It looks as though COUNT(*) is much better optimised on Oracle (e.g. by counting leaf nodes in an index) than on PostgreSQL, but in any case, the amount of extra work is prohibitive in both databases. About two years ago, we’ve published this post about the 10 most popular DB engines, where we analyzed the data published by Solid IT on their DB Ranking website. The top 3 elefants are still Oracle, MySQL and Microsoft SQL Server, but the runner-ups have changed. While PostgreSQL is still gaining traction, it has lost grounds compared to MongoDB. Also, Cassandra and Redis have pushed out Sybase and Teradata from the top 10! When 2 years ago, there had been only a single non RDBMS in this top 10 list, there are now 3, all of which “schema-less”, and they’re gaining additional momentum. Clearly, vendors of RDBMS will need to move quickly to accommodate the needs of document storage and key-value storage the way their new competitors do. With the recent release of jOOQ 3.7, we’ve added another three databases to our list of now 21 supported RDBMS. Compared to last year’s ranking, almost all of these RDBMS are gaining traction as well, apart from SQL Server.